Please bring your ID**, like your passport, UK driving license, National Identity card or a Government issued identification. Fill in the ‘send’ form and hand it in at the counter– you’ll be able to include a brief message to the recipient too. “EXCLUSIVE! Every Post Office customer will receive a MoneyGram Plus™ card, making repeat transactions quicker and easier. You can choose to include the fee in your total amount or pay it separately. As well as the transfer fee, a currency exchange rate may also apply. IMPORTANT! If you are sending £800 or more, you MUST to upload an image of the ID** used during the transaction to id.moneygram.com – you will only need to do this once. Ask the person who’s transferring the money to give you their reference number. Visit a Post Office branch that offers MoneyGram (find your nearest branch using the branch locator above), taking a form of ID**with you (passport, UK driving license, National Identity card or a Government issued identification will do). Fill in the ‘receive’ form and collect your money transfer. IMPORTANT! If you are receiving £800 or more, you MUST to upload an image of the ID to id.moneygram.com – you will only need to do this once. *Subject to agent operating hours and compliance with regulatory requirements. **Passport, UK driving license, National Identity card or a Government issued identification. 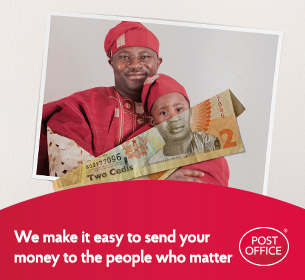 Post Office Limited is an agent of MoneyGram International Limited in the provision of money transfer services. MoneyGram and the Globe are trademarks of MoneyGram. All other marks are the property of their respective owners. MoneyGram International Limited is authorised and regulated in the United Kingdom by the Financial Conduct Authority. ©2017 MoneyGram.